House of Plenty Turtle Pie a pie, that you can make at home, it comes complete with caramel, pecans, chocolate chips, and a luscious chocolate center. Whenever I make the House of Plenty Turtle Pie, it is gone so quickly. Everyone seems to love, the House of Plenty Turtle Pie, because it is packed full of caramel, pecans, and chocolate chips. Why not make a House of Plenty Turtle Pie today. You can enjoy this copycat recipe for the House of Plenty Turtle Pie. 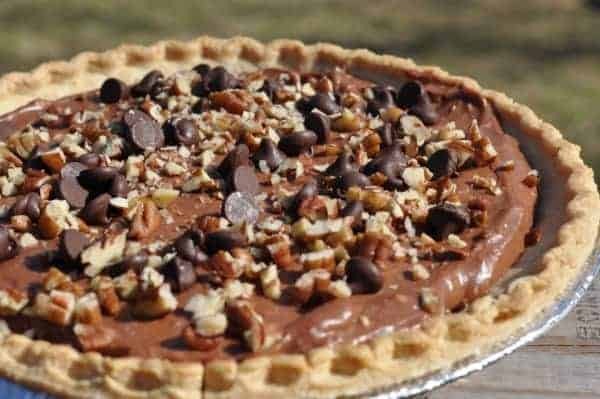 Sprinkle 1/4 of chocolate chips and pecans into pastry shell. Pour caramel topping over chips and pecans. In a mixing bowl, beat cream cheese and sugar until smooth. In a saucepan over low heat, cook ant stir cream and remaining chips until smooth. Gradually add to the cream cheese mixture; mix well. Carefully spread into pastry shell. Garnish as desired. should you refrigerate before serving?? I don’t think it in absolutely necessary, but you can do it. This is so good! I wonder how it would taste if you use dark chocolate?